Managing people is the most challenging part of any leader's job. And that job's not getting any easier as the human resources profession grows more dynamic and constantly changes. The Big Book of HR provides any business owner, manager, or HR professional with the most current information to get the most from their talent--from strategic HR-related issues to the smallest tactical detail of managing people. Each topic covered includes information on associated legal issues--such as the recent changes to the Fair Labor Standards Act's overtime regulations--and stories from leading organizations to illustrate the positive impact human resources can have on organizations of any size. Each chapter ends with discussion questions to encourage additional thought. Sample forms and templates plus a list of additional resources are also included. Select, engage, and retain the best talent for your organization. Develop attractive and fair compensation and benefits programs. Manage and develop your employees. Resolve conflict and maintain communications throughout the organization. Develop performance-management systems that reflect current trends and best practices. Use technology to effectively manage the human resources function. Barbara Mitchell is an author, speaker, and human resources consultant. She is the coauthor of The Big Book of HR, The Essential Workplace Conflict Handbook, The Conflict Resolution Phrase Book, and The Essential HR Handbook. Most of her HR career was spent with Marriott International. Barbara is managing partner of The Mitchell Group and an innovative career transition coach. Cornelia Gamlem, SPHR, president of The GEMS Group, Ltd., consults, speaks, and writes on human resource and management issues. A recognized expert in employee relations and human resources, she has coauthored four books, three with Barbara. Cornelia spent most of her HR career with a Fortune 500 IT services company with a global presence. "Whether you are new to the HR profession or are an experienced HR professional and need a ready reference of the best HR practices to improve the effectiveness of your organization, The Big Book of HR, is simply the best. All professionals in the field should keep it desk-side." "This is a comprehensive and very important book, written by two highly knowledgeable experts in the field. It addresses the topics that are core to the people issues and opportunities in any business today, and is critical information for any HR professional who hopes to be effective in his/her role within an organization." "It is ideal for a wide range of audiences--form a beginning HR practitioner to a senior level individual who needs to 'brush up' on a particular topic or area of expertise. With the recent trend of selecting business professionals from non-HR disciplines to lead an organization's HR function, this book can serve as a helpful practical reference guide." "Cornelia Gamlem and Barbara Mitchell are experts in the field of Human Resources. The authors have that unique ability to distill what can sometimes be dry HR material in to effective, no-nonsense guidance for the HR practitioner. You can depend on the clarity, insight and wisdom provided in The Big Book of HR." 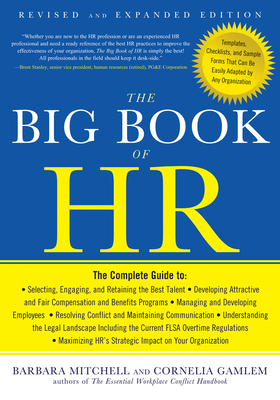 "The Big Book of HR is both a great reference book and a training tool. I would recommend this as 'must have' for HR professionals. For those who are developing talent, this is an excellent tool to test knowledge and teach core competencies."